Offer applies to first time new print orders only, minimum order 5,000 bags per size, maximum three colors. Revised copy, orders for additional sizes and reorders placed after initial order do not qualify. New print orders for 500-4,000 bags per size qualify for FREE PLATES only, 1 color print maximum. Offer is subject to review of artwork. 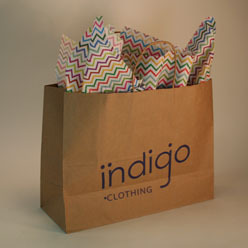 Follow this link to see our flexo printing and art guidelines for recycled paper shopping bags. 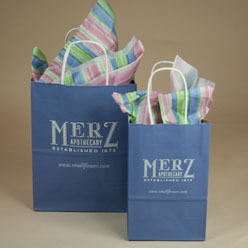 Download art templates for recycled paper shopping bags. New print orders for 5,000 bags qualify for FREE PLATES and FREE FREIGHT. Made from 100% recycled kraft, minimum 95% pcr. Bags are recyclable in almost all curbside recycling programs. Bags and all manufacturing processes are FSC certified. Can be printed in up to 3 colors with water based inks. Guaranteed no over or under run... you get just what you order. Made from 100% recycled paper, minimum 86% pcr. Versa kraft paper is white on one side, kraft on the other. Can be printed on either side. Bags are recyclable in almost all curbside recling programs. New print orders qualify for FREE PLATES. Printed on 100% recycled paper, minimum 95% pcr. Imprint is a one color hot stamp. 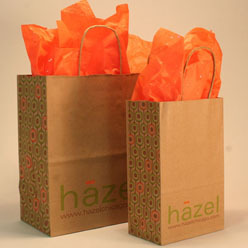 Bags can be hot stamped on one or two sides. Because of the foil stamping, bags may not be recyclable in some curbside recycling programs. Minimum order 500 bags per size. Made from 100% recycyled kraft, minimum 95% pcr. Imprint is a one color ink print. 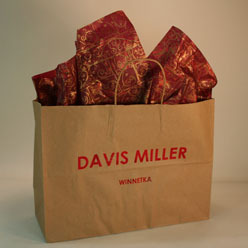 Bags can be printed on one or two sides. Bags are recyclable in most curbside recycling programs.